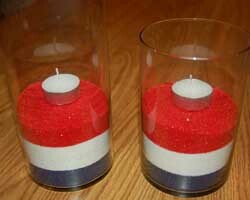 This Fourth of July sand art is a craft that is so amazingly simple to do, yet so impressive. 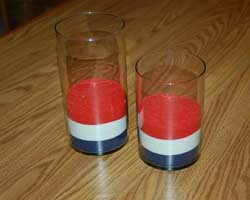 What an easy way to add a bit of ambiance, and show your patriotism. 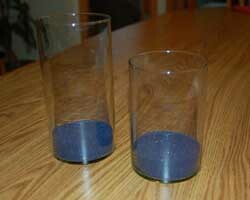 Use any glass container you may come across... different shapes really look interesting. 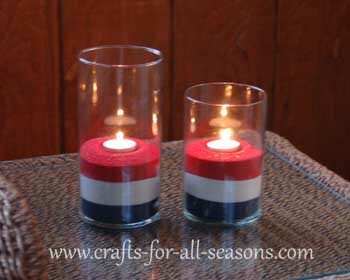 Adding a candle to each vase makes an incredibly striking centerpiece. These look beautiful glowing on the patio table for a night of fireworks. 1. 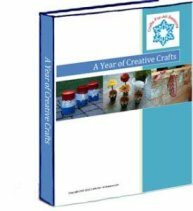 Below are the materials needed to create a striking centerpiece. 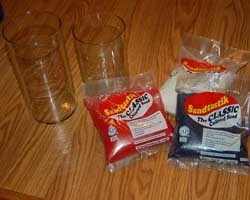 The colored sand can be found in craft stores, often near the kids crafts. 2. 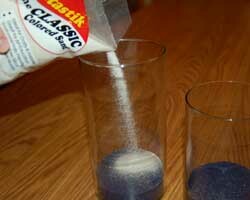 Begin by pouring in the blue sand to the bottom of the glass container. 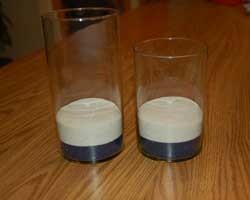 Make the layer nice and even by gently swirling the vase and tapping lightly on the table to settle the sand surface. 3. 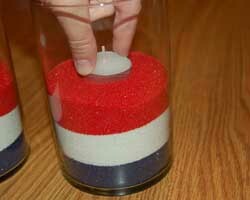 Continue making the Fourth of July sand art by gently pouring in the white sand on top of the blue layer. Try to make it the same thickness layer. 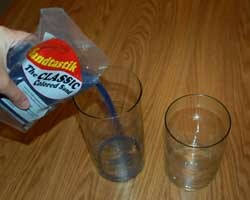 Gently settle the white sand by tapping the vase slightly. 4. Next finish off by adding the red sand, and settle the sand by tapping lightly. 5. Add a tea light or other candle of choice. For a tea light, I think it gives a better effect by pushing in the tea light holder into the sand until the candle top is about flush with the sand. 6. Light up the candles and enjoy! Remember the sand art can be enjoyed all summer, and also for Memorial Day and Labor Day.